Last weekend I saw an idea for Valentine’s gifts for my three nieces and nephew in Idaho. 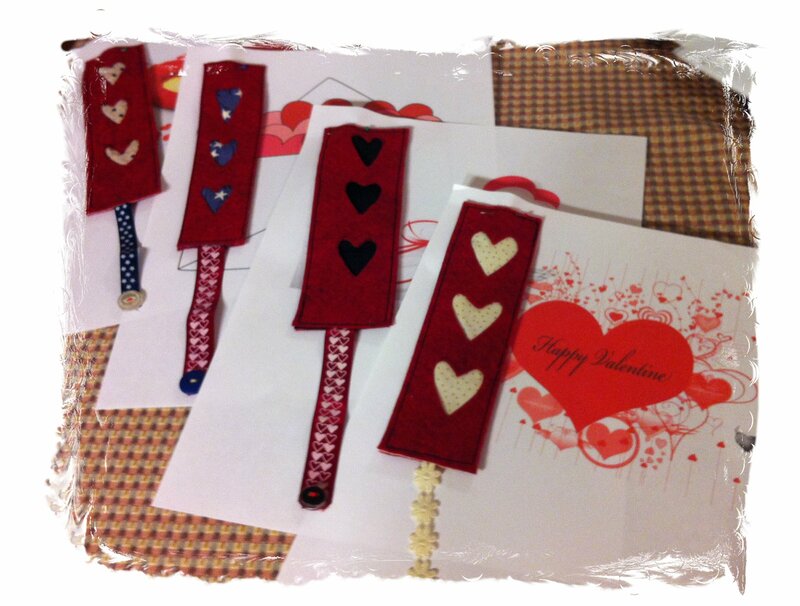 The next day (Sunday) I am in local fabric shop buying red felt for these Valentine themed bookmarks. 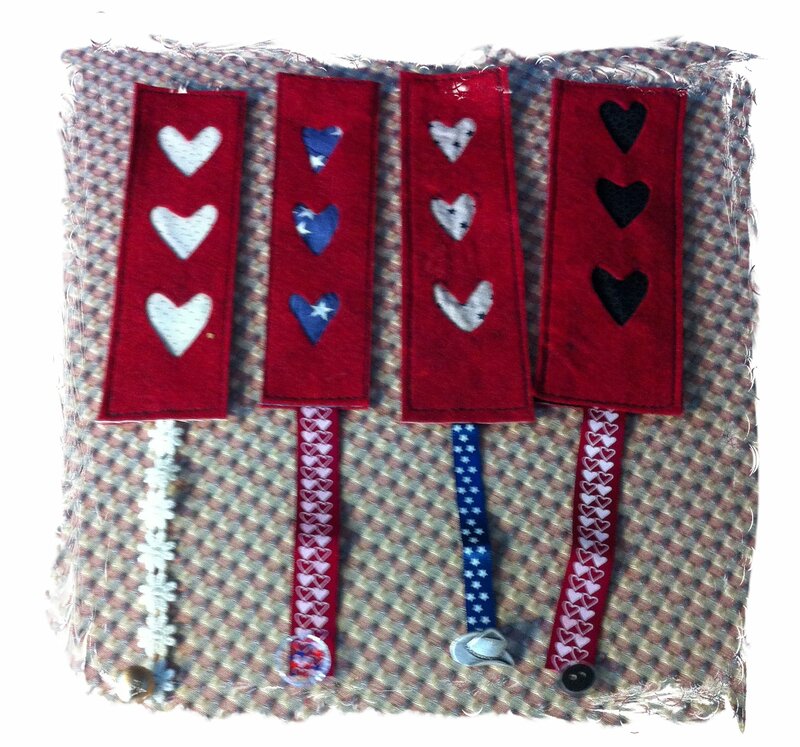 The bookmarks were assembled by Sunday night with the exception of the ribbon and buttons (to weight the book mark). It was then a simple matter of sewing the button to the ribbon which I did on Wednesday night….don’t want to rush into these things. Haha! I packaged these Thursday morning…drove to Safeway early (@ 6:45 am on my way to work) to add Barnes and Noble gift cards (my late night idea)..mailed Priority Package. Should be in Idaho today. With some determination and Priority Mail the gifts arrived on time…..well Valentine’s that is! Inside this box was a belated present for Jade. While my sewing machine (Mom’s 1954 which I love to use) has been set up in the corner of my bedroom for immediate use, I think most of the recent work was mending or curtains. It really was too much fun to be possessed by the urge to sew. When my niece told me recently that she really enjoyed cooking, I thought to myself “how about I sew an apron?” It had been a long time since used my sewing skills. It was like riding a bike again….it all came back pretty quickly…well except my injured thumb caused a slow start with threading the bobbin…..lol! 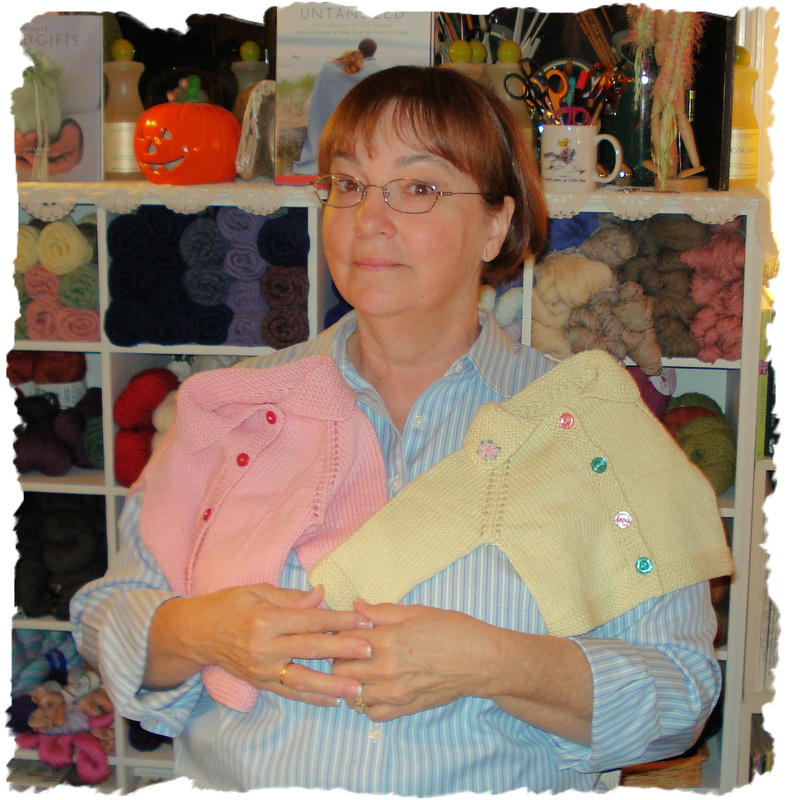 Sewing the little shirring in the center of the bottom of the pocket was fun; I particularly enjoyed creating the bias with a finished 5/8″ edge. I’ve now moved the sewing machine to a cubby in the studio area….easy instant access just to pull out and set up on big table! 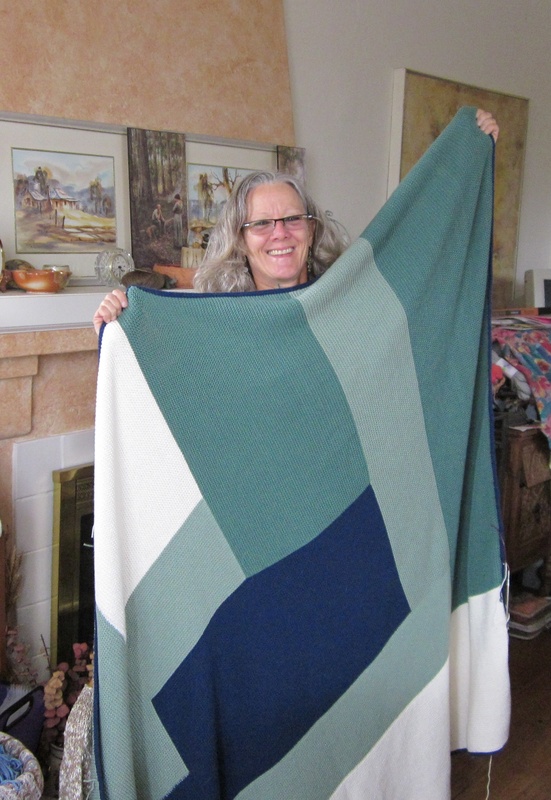 Another creation is in the works….just have to wait for material to arrive….learned earlier today one of them is being shipped from Hong Kong and won’t arrive for a couple weeks. Ugh! I didn’t see that in the fine print. This morning my sister posted a video of the kids opening their presents. You can see this on my FB page. Love technology for making things so connected! 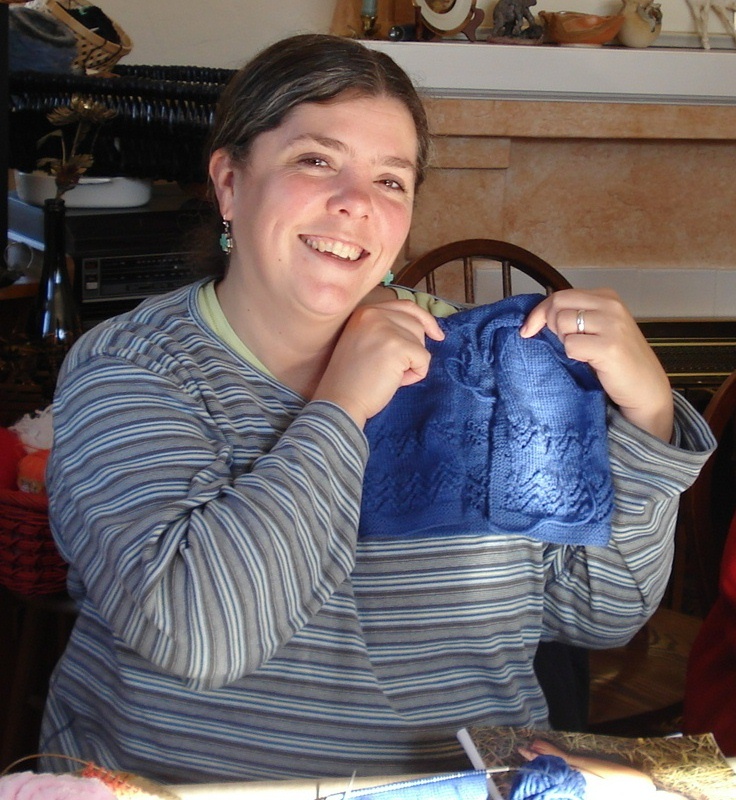 Gifts from Debra A…….given at our Friday morning knitting group last week. 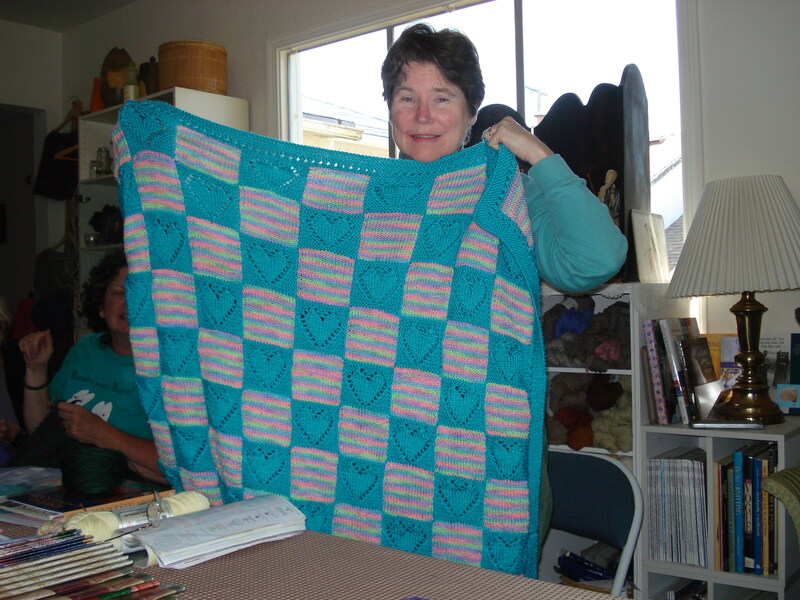 This was just a sampling…some of us had already stashed our potholders! 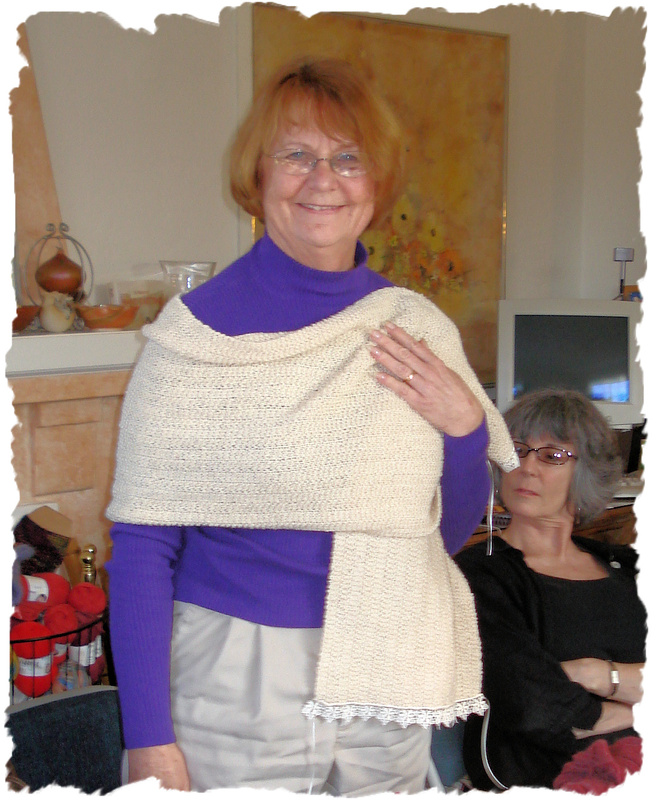 Last Friday morning workshop was a full house of…..
* Creativity…..the knitting needles were clicking. * Gifts of handcrafted potholders by Debra A. * An abundance of Valentine’s Day cards crafted by Kimberly -Daily Craftini. I meant to take a photo of the ones I purchased for gifts….but I dropped them in the mail before I whipped out my camera! *Gifts of “Filthy Squirrel” handmade soap made in Hawaii. Karen H had just returned from her vacation in Hawaii. She came with soap and stories! As so often happens my wants and time do not mesh up….which means I often post things a beat off…kind of the way I hear music! 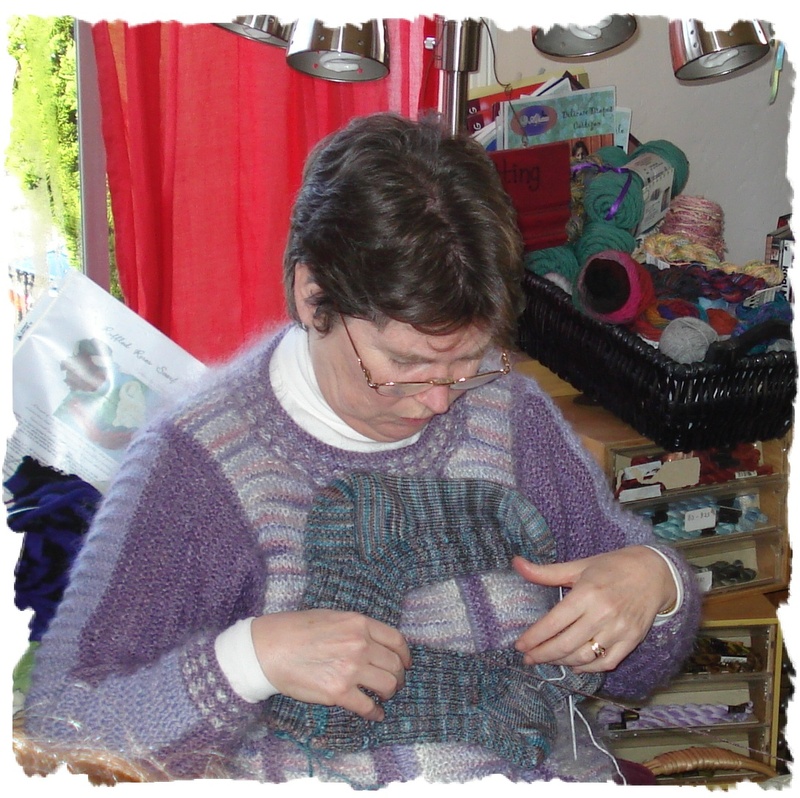 Have been thinking of Valentine’s Day…just a day past…and what could I share to show appreciation for all…particularly the knitting circle of friends……thus this post is dedicated to a showing of hearts and love to share friendship! 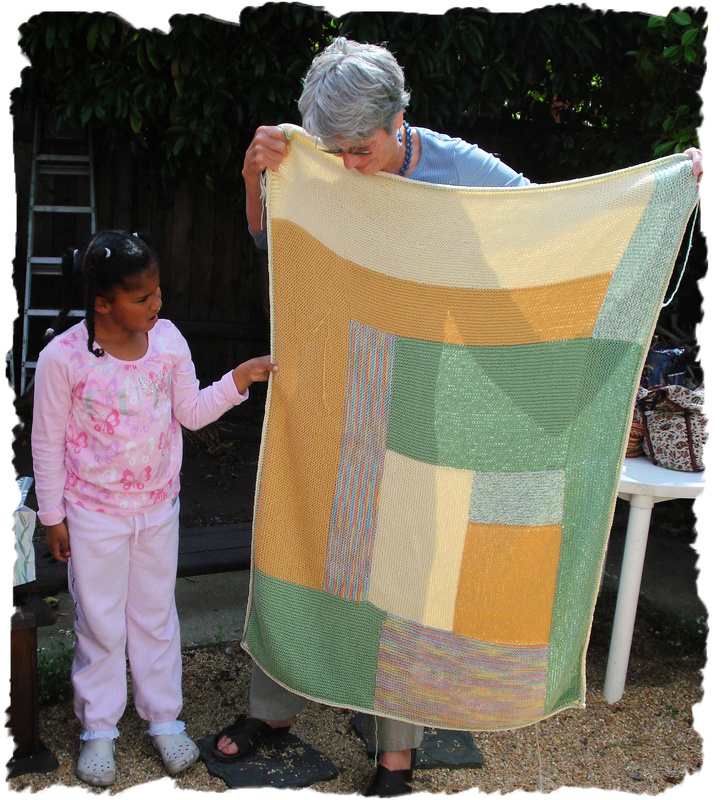 Enjoy the work and love of some (and I mean just some) of our talented knitters! 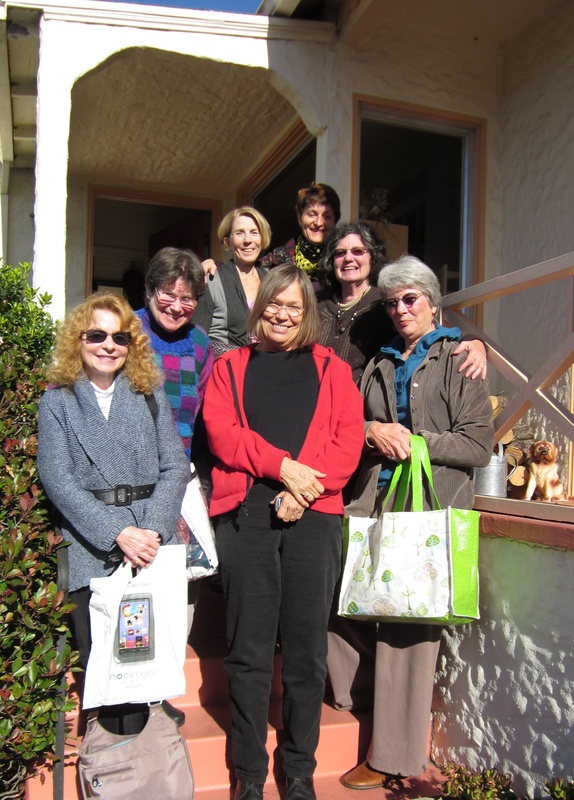 This is truly just a sampling….I see so much more each week, month, etc! I’ve barely tapped the depth of what I see and what you all do! 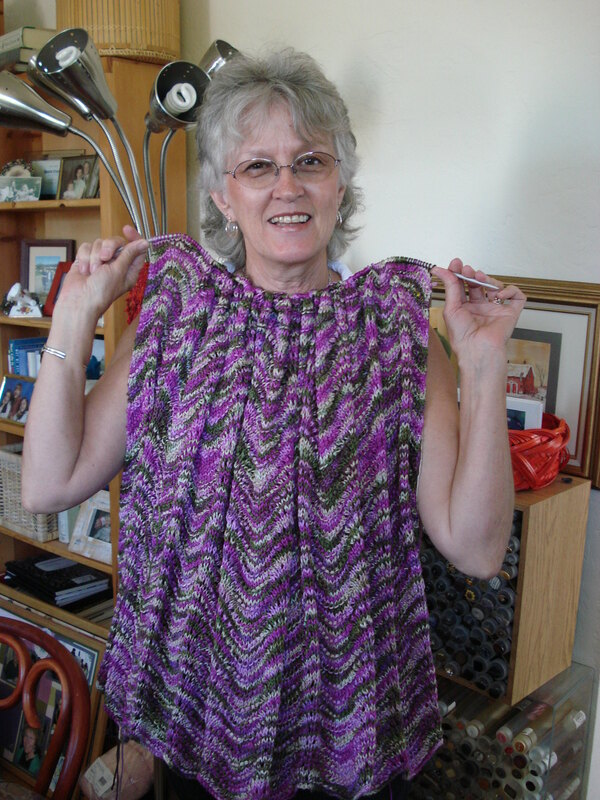 You are all an inspiration…and continue to inspire the love of knitting! 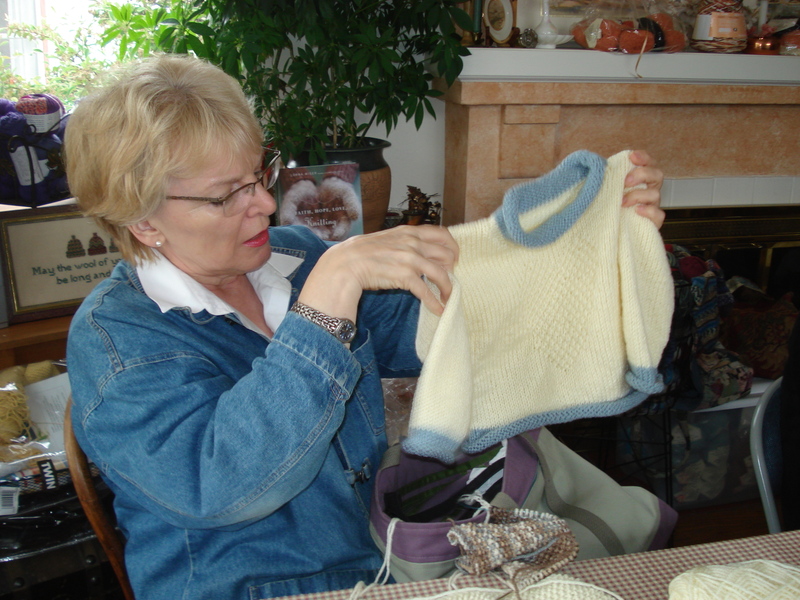 My needles are clicking…I just finished a baby surprise sweater for Bill’s newly born grandson and now knitting a sweater for my young nephew soon to be two…and a hat for Sara! 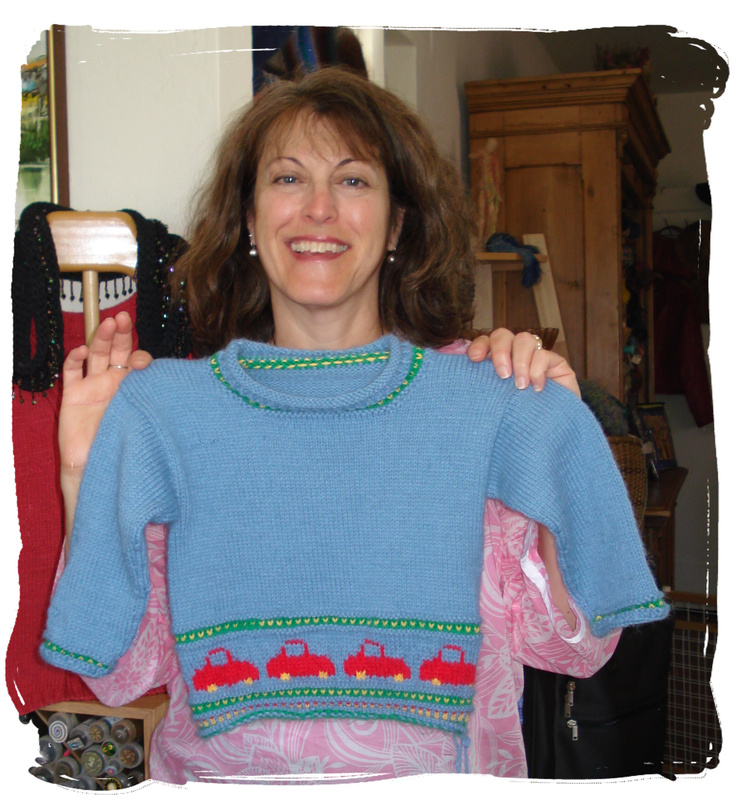 A day-after Happy Valentines to all….and a trip down Skein Lane’s memory lane! More gifts of love to follow! 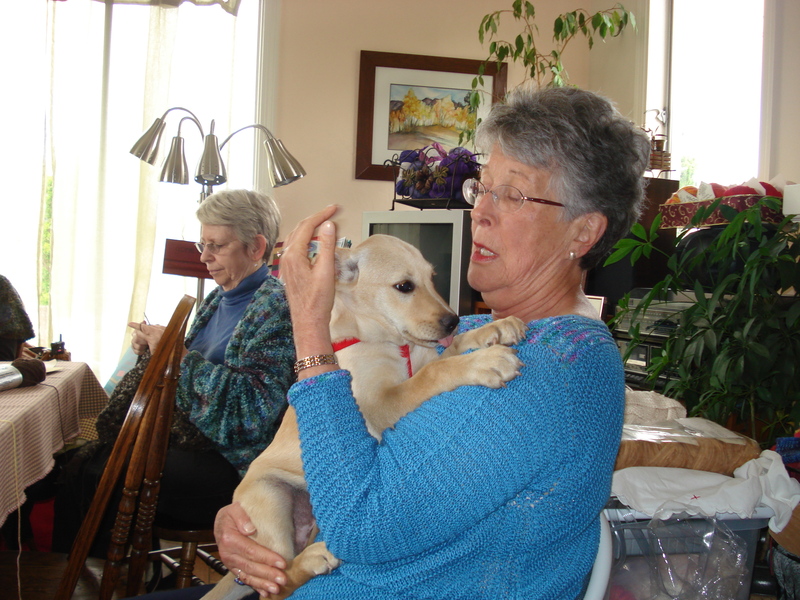 Susanne – a gift of love for her grandchild Zoe! 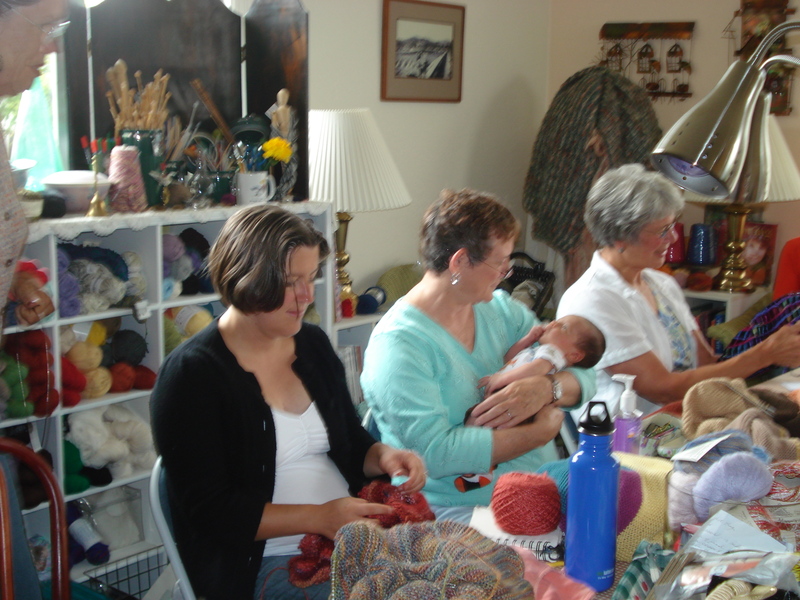 Some of the “tightly” knit Saturday group! 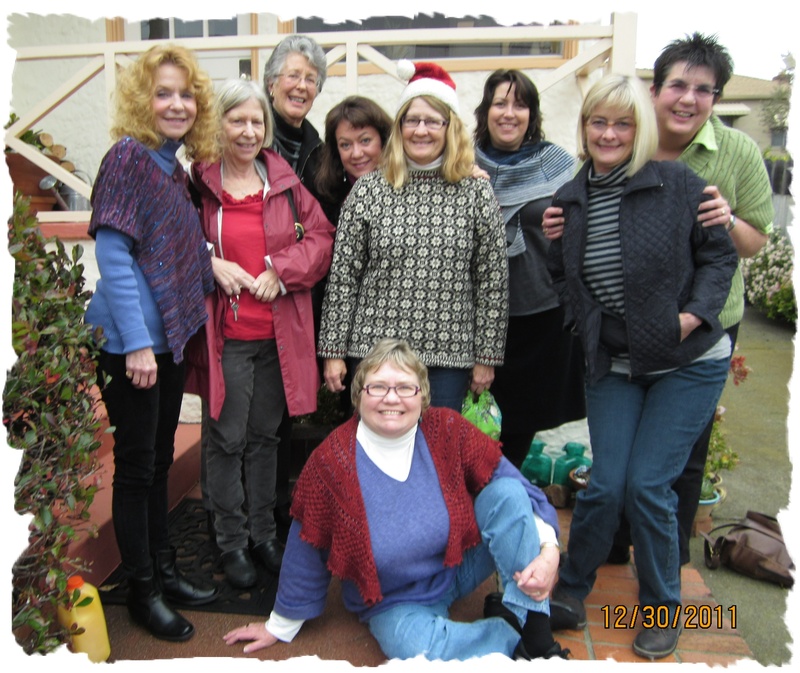 Some of the “tightly” knit Friday group! 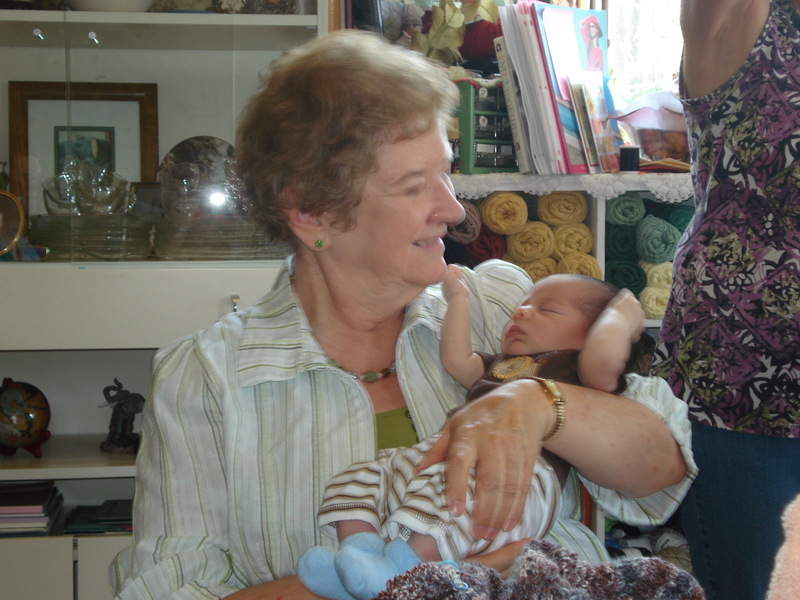 Natasha’s mother with new grandson! A blessing! 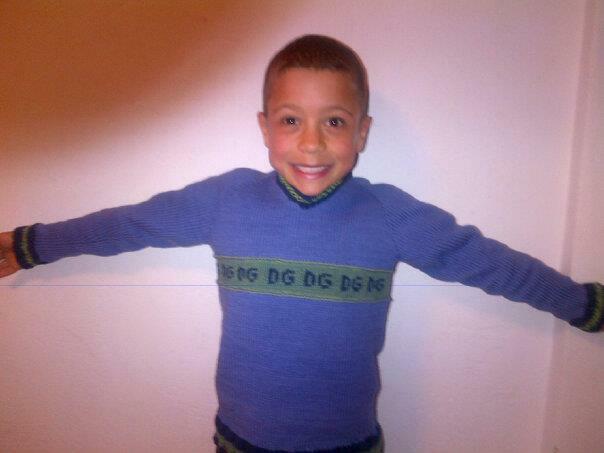 A grateful child…loving his sweater knit by his dad! 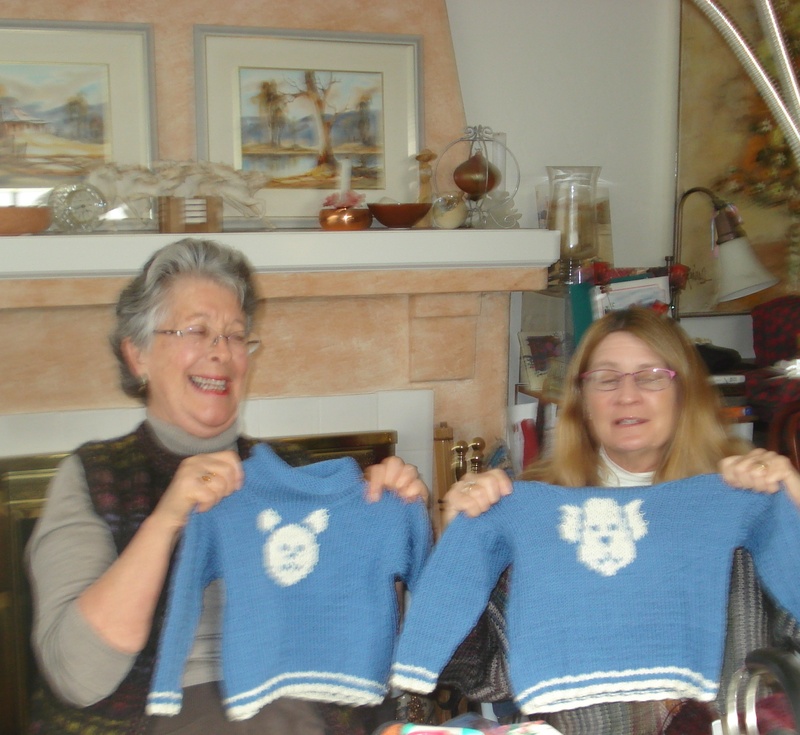 Jean and Sarah with their gifts of love! 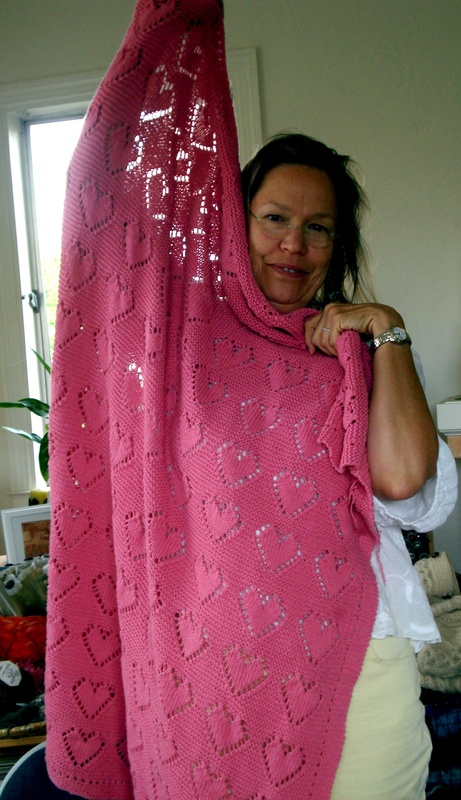 Cathy with her gift of love! 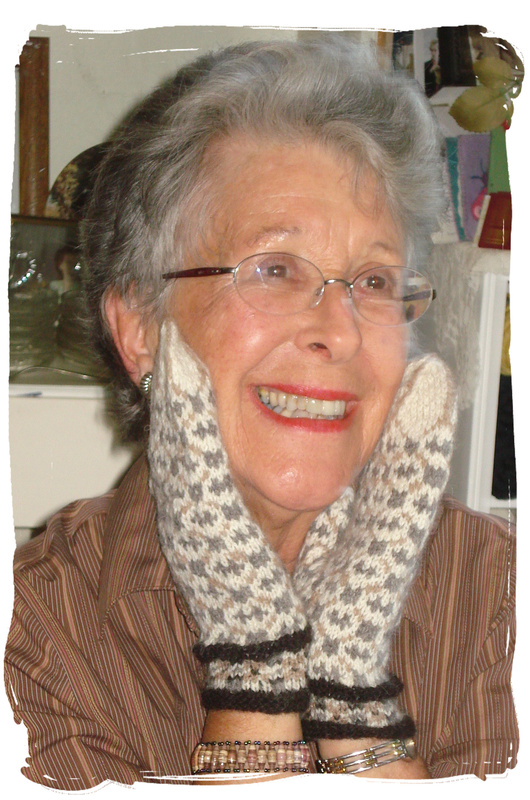 Helen with knitted gifts of love! 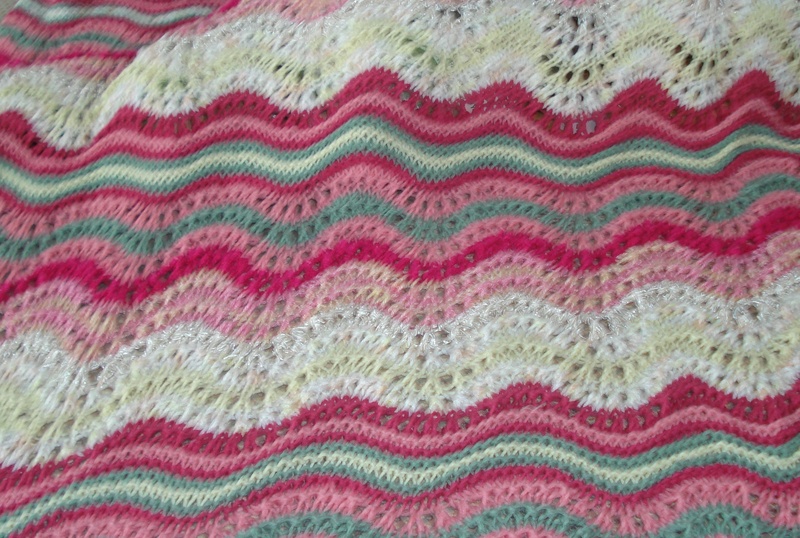 An afghan for my niece Betsy – a gift of love for her high school graduation! 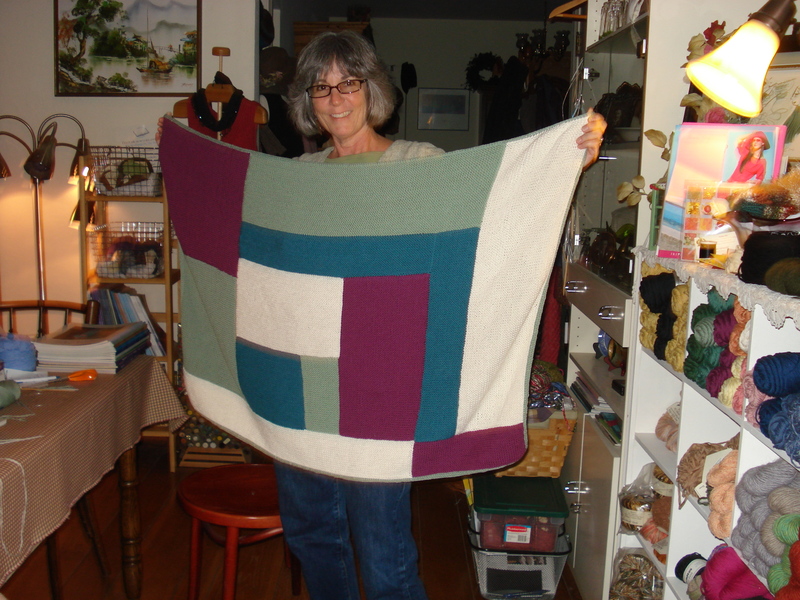 An afghan – a gift of love for my friend Barb! 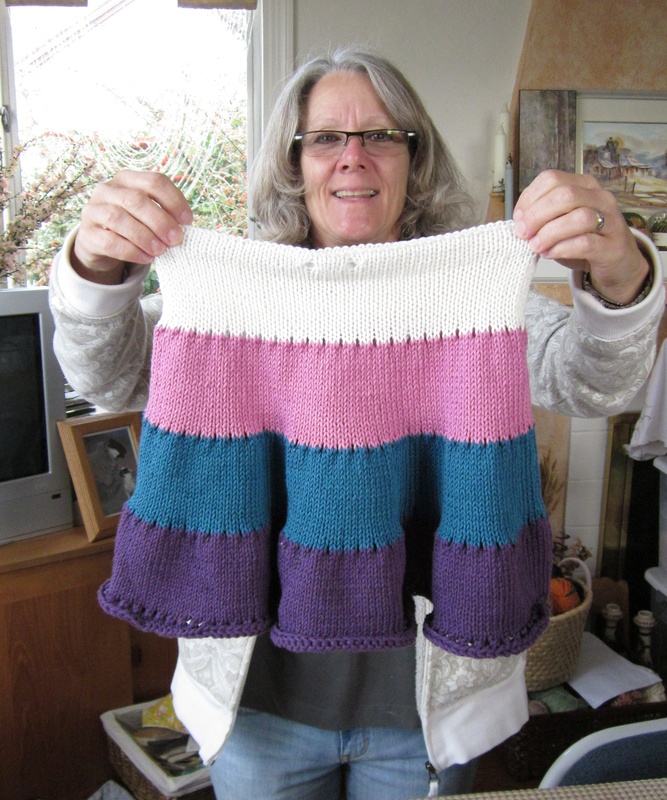 A new baby in our knitting circle!